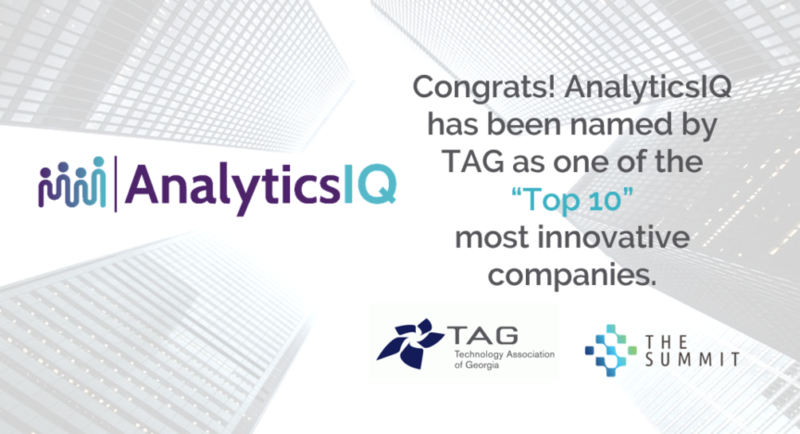 ATLANTA – March 19, 2018 — The Technology Association of Georgia (TAG), the state’s leading association dedicated to the promotion and economic advancement of Georgia’s technology industry, today announced AnalyticsIQ as one of its Top 10 Innovative Technology Companies in Georgia. TAG will recognize this prestigious group at The Summit 2018 on March 20-21, 2018, at the Cobb Galleria Centre. The “Top 10” most innovative technology companies are chosen from among TAG’s “Top 40” 2018 list and were chosen based on a number of criteria, including: degree of innovation; scope and financial impact of innovation; likelihood of success; and promotion of Georgia’s innovative efforts nationally and internationally. The event will feature nationally recognized keynote speakers, winners of the Top 40 and Top 10 Innovative Georgia Companies competition, the newest inductee into the Technology Hall of Fame of Georgia, networking opportunities, and a two-day exhibitor showcase. Moreover, through interactive strategy sessions and more than a dozen breakout sessions, attendees will help chart the course for the State’s technology community for the coming year and beyond. TAG is the leading technology industry association in the state, serving more than 35,000 members through regional chapters in Metro Atlanta, Athens, Augusta, Columbus, Macon/Middle Georgia, and Savannah. TAG’s mission is to educate, promote, influence and unite Georgia’s technology community to foster an innovative and connected marketplace that stimulates and enhances a tech-based economy. Additionally, the TAG Education Collaborative (TAG’s charitable arm) focuses on helping science, technology, engineering and math (STEM) education initiatives thrive. For more information visit the TAG website at www.tagonline.org or TAG’s community website at http://www.hubga.com. To learn about the TAG-Ed Collaborative visit http://www.tagedonline.org/.